Well, we think so! Salobreña is located on the Costa Tropical half way between Almeria and Malaga. The Costa Tropical has it's own micro climate which ensures we have the best weather on mainland Europe. With 300 days sun a year, we can almost guarantee you'll have as much sun as you need for your summer holiday. Salobreña is a small, whitewashed town nestled on a hill, which is dominated by the ancient castle. Set in the old town, the pretty houses set in narrow cobbled streets with sufficient bars along the way make the climb worthwhile. The newer part of town which is high-rise free, has plenty of bars, restaurants and enough shops that you don't even have to venture further afield if all you want to do is enjoy a stress-free holiday with minimal driving! The evenings can be spent taking a leisurely stroll along the promenade before deciding at which beachside restaurant you would like to sample the wonderful Spanish hospitality, not to mention the delicious catch of the day! Of course, you might decide to visit us in the winter when the ski resort, high up in the Sierra Nevada, is just an hour drive away. Monte De Los Almendros is a community of around 300 individual houses. It has a truly international feel, being home to over 20 different nationalities. One of the main features of the community are the two communal swimming pools, tennis court and recreational area, all of which are free to use for guests at Casa Roca. So whether you feel like mixing with the neighbours by the pool, or being a little more energetic with a game of tennis, one of the benefits of staying here is the choice of where to enjoy the fantastic views and lovely climate. Of course, aside from just relaxing and enjoying the spectacular scenery around Casa Roca, there are plenty of other things to see and do. 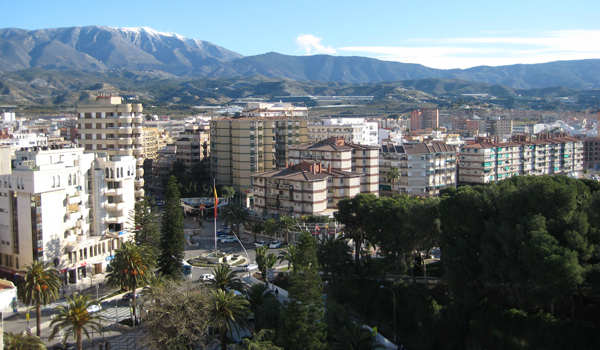 The nearest town to Salobreña, Motril is 10 kms to the east and is the local port. The main town is a maze of narrow streets, filled with an array of independent shops. It's a great place to spend a day wandering around, with plenty of pavement bars and cafes for regular refreshment breaks. The lovely marina is where you will find all sorts of water sports facilities and boat excursions; you can even take a day trip to Morocco. For a bit of culture, in the centre of Motril is the Parque Botanico De Los Pueblos De America, a beautiful park with gardens, ponds and a childrens play area. Set within this park, the sanctuary of the Virgin of Cabeza (patron saint of the village) is free to enter, and is well worth a visit. 13 kms west of Salobrena, Almuñécar is a larger town but still maintains a real spanish feel. Steep winding streets lead from Almuñécar's central square. This part of town has no vehicle access and is a network of quaint little shops and authentic bars. Down towards the beachfront, you can find more restaurants and bars, and a modern plaza with a lively night scene. Worth noting there are also some great ice cream parlours down here! Tucked behind the beachfront, one of the prettiest squares, Plaza Kelibia is a great place to just spend an evening in one of the bars, enjoying a plate of tapas and watching the world go by. Almuñécar is also home to the Lori Sexi ornothological park which is home to over 1,000 birds, and down on Velilla beach, the Aquatropic water park is a great place for kids of all ages. Here you can also find a few bars showing English sports, should you feel the need! Just west of Almuñécar, it's worth mentioning La Herradura, another lovely place to go for an evening stroll followed by a meal in one of the beachfront restaurants, and Marina Del Este, a beautiful marina surrounded by some of the finer eating establishments that you will find in the area. Just 70 kms inland, Granada is the capital city of the province, at the foot of the Sieraa Nevada Mountain range. For those seeking history and culture, there is no better place to visit. Surrounded by the Moorish Albaican quarter, the Alhambra Palace has to be on your must see list. With its beautiful palaces, gardens and patios, its ancient towers and walls, make sure you take your camera, and be prepared to be stunned! Note - in the summer it is worth booking tickets in advance, as the queues to get in can be extremely long, hot affairs! Aside from the Alhambra, the city itself is steeped in history, but also has plenty for those seeking the delights of shopping, eating and entertainment. Just grab a tourist guide and go explore ! The most southerly ski resort in Europe, the Sierra Nevada is open from November through to April, and at only an hour from Salobrena, it's possible to ski in the morning, and be back on the beach in time for siesta time! Catering for skiers and snowboarders, the national park of the Sierra Nevada is also a hikers/birdwatchers paradise. The Alpujarras, are a beautiful collection of white villages, surrounded by stunning countryside. It's well worth taking a car for the day and going back in time to get a flavour of the real Spain. Each village has it's own individual characteristics, but you'll find a common theme in the narrow streets, quaint buildings and little bars serving authentic Spanish cuisine.